The Wheel of Fortune card shows a giant wheel, with three figures on the outer edges. Four Hebrew letters – YHVH (Yod Heh Vau Heh), the unpronounceable name of God – are inscribed on the wheel’s face. There are also the letters TORA, thought to be a version of the word Torah, meaning ‘law’, or TAROT, or even ROTA (Latin for ‘wheel’). The middle wheel has the alchemical symbols for mercury, sulphur, water and salt – the building blocks of life and the four elements – and represents formative power. On the outer circle is a snake, the Egyptian god Typhon (the god of evil), descending on the left side. The snake also represents the life force plunging into the material world. On the right side rises the Anubis, the Egyptian God of the dead who welcomes souls to the underworld. And on top of the wheel sits the Sphinx, representing knowledge and strength. 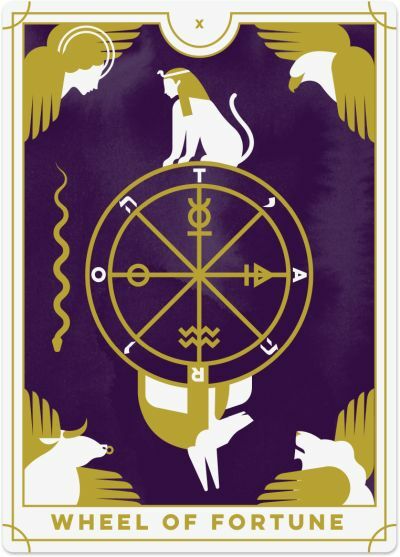 In the corners of the Wheel of Fortune card are four winged creatures, each associated with the four fixed signs of the Zodiac: the angel is Aquarius, the eagle is Scorpio, the lion is Leo, and the bull is Taurus. Their wings signify stability amidst movement and change, and each holds the Torah, representing wisdom. The Wheel of Fortune reminds you that the wheel is always turning and life is in a state of constant change. If you’re going through a difficult time rest assured that it will get better from here. Good luck and good fortune will make their return in time. Similarly, if things are going well, know this, too, will change and life may return to ‘normal’ soon. This cycle shows why it is so important to cherish the blissful moments in your life and make the most of them while they are within reach – because in a flash they could be gone. The Wheel of Fortune is also known as the wheel of karma and reminds you that ‘what goes around comes around.’ Be a kind and loving person to others, and they’ll be kind and loving to you. Be nasty and mean, and you will get nasty and mean turning back your way. So, if you want happiness and abundance, make sure you’re sending out that positive juju in kind. What you send out into the Universe will come back your way. The Wheel of Fortune card asks you to be optimistic and have faith that the Universe will take care of your situation in the best way possible. Meditation and visualisation can reinforce your intention to bring increased abundance, good fortune and prosperity to you. Your life is about to turn in more positive directions if you are willing to grow and expand. Keep your mind open to all kinds of synchronicities and signs from the Universe. The magic of fate and destiny is behind you, and miracles are happening. Be open to the help of others, too, as guidance from both the physical and spiritual realms is supporting you along your journey. They want you to do well, so relish their support right now. Call on them any time you need it. You may also feel compelled to work with the archangels and ascended masters to support and guide you. If you are someone who likes to have control and stability, then the Wheel of Fortune may come as a shock to the system. 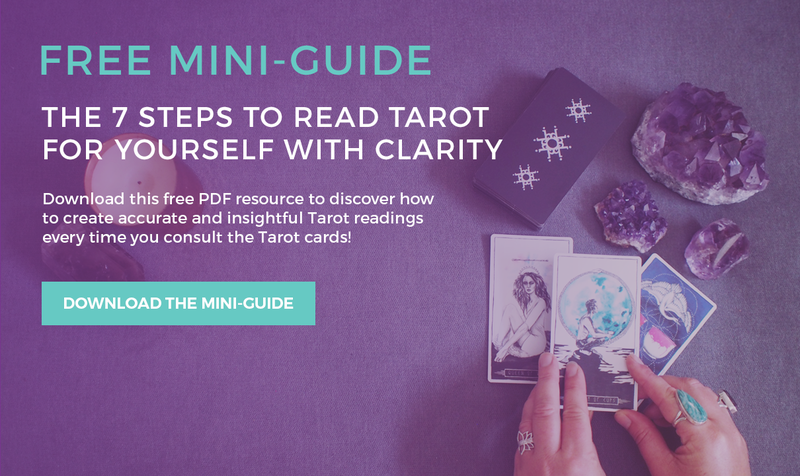 This Tarot card suggests that factors outside your control are influencing your situation. It is as though the Universe is dishing up whatever it pleases; it's unpredictable and unnerving. This is one of the challenging aspects of the Wheel of Fortune since no matter which way the Wheel turns, it is impossible to try to change it. You need to accept what is happening and adapt. Go with the flow! Finally, the Wheel of Fortune can show a critical turning point in your life. Opportunities you could never imagine are suddenly available to you, and you have the chance to make a significant change in your life. While it may be unexpected and unfamiliar, see this as an invitation to turn things around and take an entirely new direction in your life. The more you tune in to your intuition and allow the Universe to guide you, the better the outcomes will be. When the Wheel of Fortune is reversed, your luck and fortune may take a turn for the worst. You may experience unexpected change or negative forces could be at play, leaving you helpless. You have a choice: you can do nothing and hope things will get better, or you can act to improve your situation. See this moment as your opportunity to take control of your destiny and get your life back on track. Changing your destiny starts with accepting responsibility for where you are now. Consider what role your earlier actions have played in your present circumstances. Even when you think everything is beyond your control, there is often something you could have done differently that might have changed where you are now. What can you learn from this situation and how can you apply it to your future life, so you don’t end up making the same mistakes? The reversed Wheel of Fortune can also reflect resistance to change, particularly if you feel it forced upon you. This card suggests that change has become a source of significant stress, and you may be trying to consciously or subconsciously stop events from running their course. Accept that change is inevitable and you will have a much-improved experience when you can go with the flow. On the positive side, the reversed Wheel of Fortune might mean that you are finally breaking a negative cycle that has been present in your life. Perhaps you have realised how your actions have created a repetitive situation and are now ready to break free from the cycle. For some, this may flow naturally following a period of introspection and self-discovery. For others, things may need to hit rock bottom before you are ready to see what is no longer serving you (especially if the Devil or Tower is in your reading).